In the warmer months of the year, boaters can enjoy the sun and spend time relaxing out on deck. However, the sea surface reflects sunlight and can intensify the rays’ strength as a result. The last thing you want is to suffer bad sunburn or worse, sunstroke while as sea. In this post, we give you some sun safety tips for how to avoid sunburn onboard. This goes without saying but some boaters tend to use an SPF that is too low for them. This is dangerous as it can easily lead to bad sunburn. 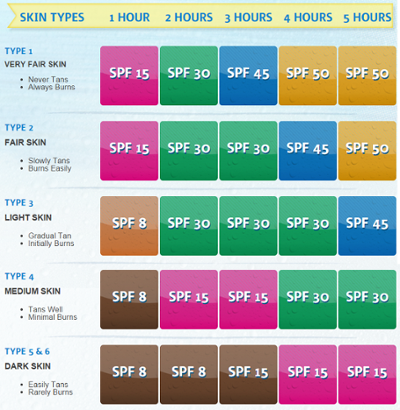 This chart gives a quick and easy guide to the factor you should be using for your skintype. Waterproof Formulas – After getting into the water, these types will protect your skin for up to 80 minutes. Water Resistant Formulas – After getting into the water, they will protect you for up to 40 minutes. Sweat Resistant Formulas – Protect up to 30 minutes with continuous heavy sweating. Nice! Children’s Sunscreens – Make sure to use maximum SPF (50) and re-apply regularly throughout the day. Do not use sunscreen on infants less than 6 months old. You don’t need a particularly expensive pair. Just make sure the ones you get are polarised (to cut the glare), and protect against UVA and UVB radiation. It’s strongly advised to wear a hat when out on deck in sunny weather. This will help you avoid heat exhaustion and protect the delicate skin on your face. After all, you don’t want to wrinkle that precious mug!